Canton Tower on the Pearl River in China at Night. Beautiful photos! I like the contrast between the papers you used Robynne! Great choices! This is for the Layout challenge using kits made and uploaded in March 2019. 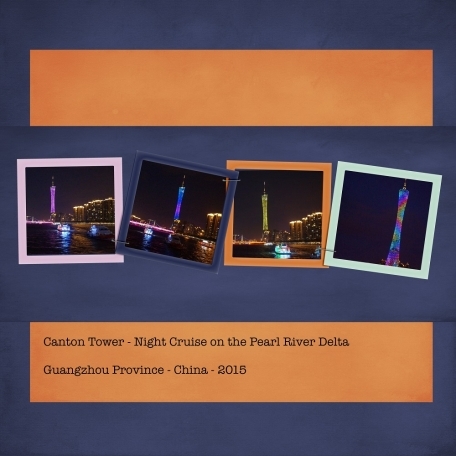 The frame element was perfect to show off some of the photos I had, of the colourful Canton Tower in China. I know this is a very simple layout, but when I tried to add some extra elements from the elements 2 kit, they just did not look right, so I opted for none.